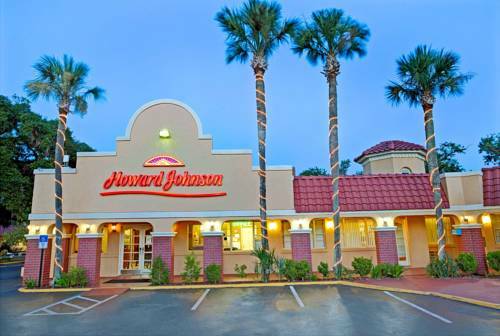 Spend your next family vacation in the heart of historic St. Augustine at this Howard Johnson Inn Historic St. Augustine FL. Walk to Fountain of Youth Archaeological Park to experience how Ponce de Leon discovered Florida in the 1500s and the spring which he believed would provide eternal youth. Take a tour on the Old Town Trolley, or taste wines at San Sebastian Winery a mile away. The St. Augustine Lighthouse and Museum and The Alligator Farm are nearby. Walk to many nearby restaurants. Start your day right with a complimentary Rise and Dine continental breakfast, and plan your day with complimentary wireless Internet access. Enjoy the outdoor pool, 24-hour front desk staff, 24-hour lobby coffee service, and guest laundry facilities. Book your next social or business event in the banquet room. All spacious guest rooms include microwave, refrigerator, and TV with HBO. Suites, smoke-free and handicapped-accessible rooms are available.